Ohorongo CEM II A-LL 42.5N Portland Limestone Cement is a hydraulic binder according to SANS 50197/NAMS 197. The main component is Portland cement clinker, finely ground together with high quality limestone and calcium sulphate, which controls the setting time of Ohorongo CEM II A-LL 42.5N. Ohorongo CEM II A-LL 42.5N Portland Limestone Cement is designed to meet a strength class 42.5 with a normal early strength “N”. The “LL” indicates limestone of high quality and “A” represents 6%-20% of mass. Ohorongo CEM II A-LL 42.5N Portland Limestone Cement can be used in applications where a higher strength class is required. Typical applications are ready-mix concrete, structural concrete, precast products, small scale brick and block making and shotcrete. Ohorongo CEM II A-LL 42.5N is compatible with commercial chemical admixtures. 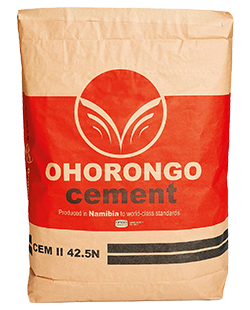 OhorongoCement offers technical support from its comprehensively equipped chemical-, cement-, and concrete laboratories. Assistance to cement- as well as concrete aspects, including advice on mix design is available from our qualified technical staff.